At Willowcroft Community School Foundation Stage we are proud of our caring, creative and happy environment where all individuals are valued equally and encouraged to achieve their full potential. We are a kind, friendly, hard working and generally an amazing class. This year Frogs are being taught by Miss Paynter and supported by our fantastic Teaching Assistant, Mrs Harris. We are very friendly and invite you to pop in for a chat if you have any queries or concerns - the classroom door is open from 8.30am everyday and Miss Paynter will be available to speak to you before class starts at 8:40am. There is also time at the end of the day or if you would like a longer meeting please speak to Miss Paynter or the office to arrange. There will be regular updates/photographs on this page so that you can see what we have been getting up to during the week, as well as important information for parents and reminders of any key dates coming up this term. There are also useful links to help with your child's learning at home (scroll down to bottom of page). Weather appropriate clothing - Please make sure that your child has a warm waterproof coat and wellies in school. Wellies are needed for Forest School but are also very useful for the KS1 garden in this wet weather! As the weather gets colder, can you also ensure your child has a hat and gloves and that ALL of your child's clothing/wellies/shoes etc. are named. Please check class window for updates to timetable. It's wonderful to be back with my lovely Frogs! 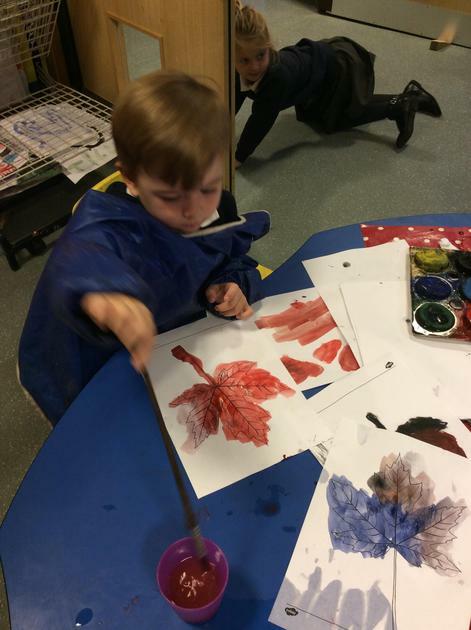 This week we have been learning about Autumn and in particular, Halloween and pumpkins and have even been creating some of our own spells and potions! We have had some really interesting discussions about ingredients and came up with ideas of using witches tears, slime and even chicken toenails! We even managed to all have a go at writing down our potions and some of us went outside to mix them together in the mud kitchen. 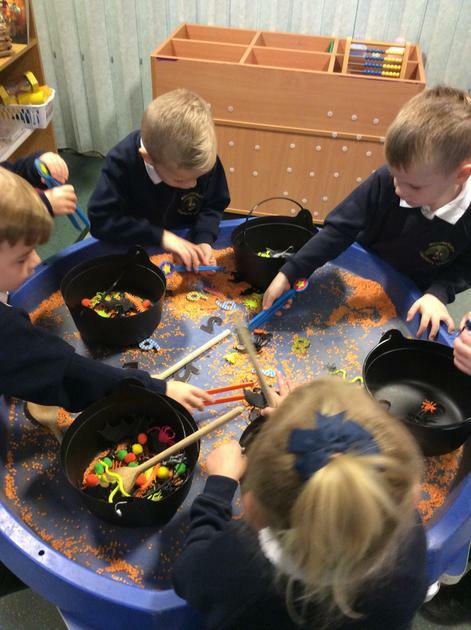 We have also been practising our fine motor skills by challenging ourselves to choose ingredients for our spells in a fun cauldron game! In Maths, we have been looking at Money - in particular, recognising our British coins and their values. We are experts on 1p, 2p, 5p, 10p and £1 and would love to show you at home what coins you have in your purses and wallets! Group 1 have had an amazing time at Forest School with Mr. Jones and even managed to find a Slow Worm this week! 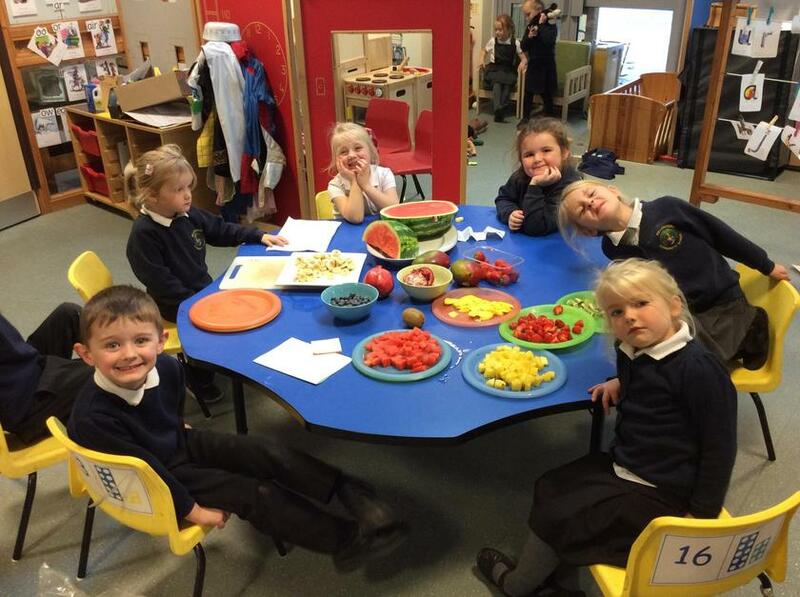 We will be starting our new ‘Health and Happiness’ topic this term and have lots of exciting learning planned. 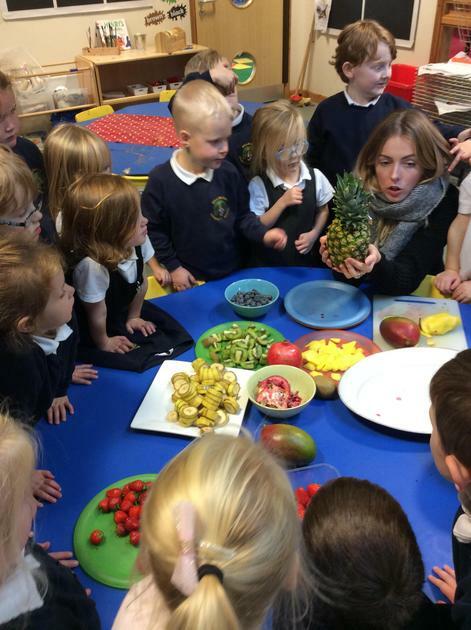 In the Early Years Foundation Stage we plan our teaching alongside the children’s interests. 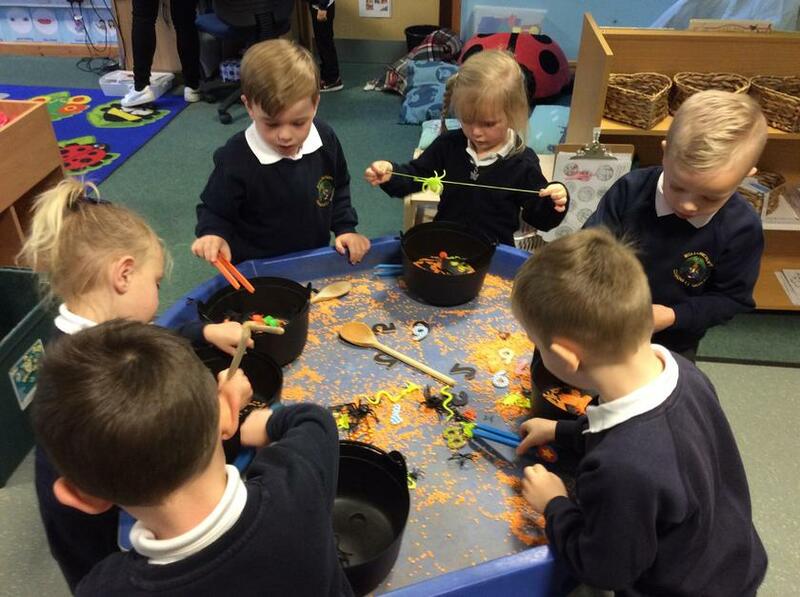 If the class is really interested and engaged in a particular topic or an activity spurs them on to want to find out more, we adapt our teaching and what we are doing to match their enthusiasm! Confused about how to pronounce the sounds found in Read Write Inc. Phonics? Worry not - 5-year-old Sylvie is here to show you how! Use this guide to support your child when practising the sounds at home! 'Sound-blending' describes how children learn to join sounds together to make words with Read Write Inc. Phonics. This video tutorial will help you support your child to practise sound-blending at home. The indoor curriculum provides a stimulating learning environment and opportunities for the children to experience a quiet reading corner, interactive whiteboard, role play area, writing area, construction area, creative area, maths area and an understanding the world area. There is a wide range of resources available to the children through planned opportunities for both child initiated and adult led activities. 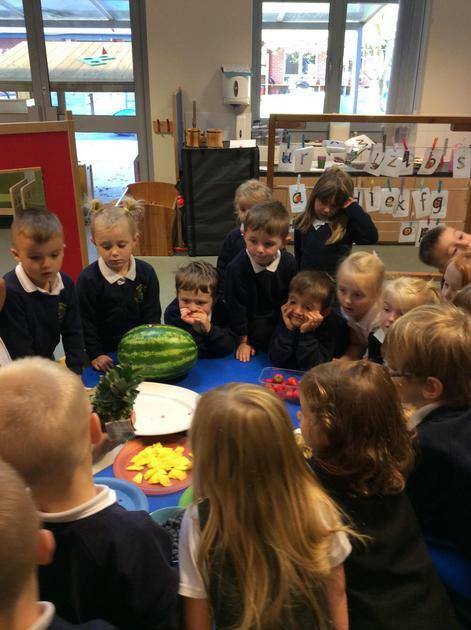 The outdoor environment mirrors the indoor learning environment within Reception and it is used daily within the daily routine. Children will be able to access resources to develop the seven areas of learning. Outdoor learning is key to developing children’s independence, physical development and to offer exploration and investigation opportunities. Miss Paynter will assess your child regularly using the Foundation Stage Profile which enables us to track your child’s development. Continual assessment is carried out on every pupil through observations, annotating their work, questioning and monitoring reading. Assessments are recorded in a number of ways in each child’s individual profile including short and long written observations and photographs. A Safe and Secure Place to Learn: Clear boundaries and rules are explored with the children so they understand why they are in place promoting confidence and security. ‘If a child feels security and love they can be happy. If a child is happy they can learn’. Willowcroft EYFS staff 2015. Parents as Partners: We understand the importance of parents in their role as prime educators and work with parents to build on home experiences and learning to plan next steps through our ‘Challenge Passports’. We hold information/teaching session so that parents can understand our strategies and policies. Forest School: A wealth of outdoor learning opportunities. A choice for every child to play, explore and make sense of the world around them. Please see the links below to websites that will help you support your child with Reading, Writing and Maths. You can also visit the CEOP Website for fun games and advice for children relating to internet safety. Phonics Play A website with great phonics games for you to play at home!